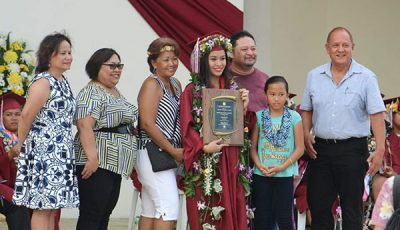 Surrounded by family and friends, Marian Deleon Guerrero Tudela became Saipan’s first female mayor after being sworn in yesterday at the Coral Ocean Point Resort. The 69-year-old was appointed by Gov. Eloy S. Inos to serve as mayor of the island for the remainder of the late Donald P. Flores’ unexpired term. Flores passed away from a massive stroke on June 2. 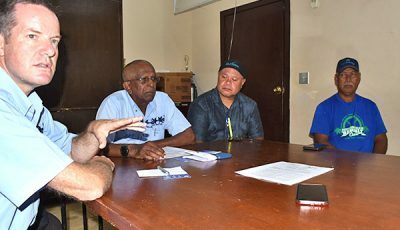 Saipan and Northern Islands Municipal Council chair Ramon B. Camacho served as acting mayor while awaiting Tudela’s return to Saipan from Arizona. “Thank you for joining me this morning in my swearing in as mayor. I really appreciate and happy that you all came here today, but at the same time I’m very sad because Mayor Flores left us. Mayor Flores left me six months to finish his work and I promise you that I will do my very best to serve the community and continue whatever [job] he left for me [to do]… Seven months is too short but I will try,” she said inside the crowded Double Eagle Restaurant. 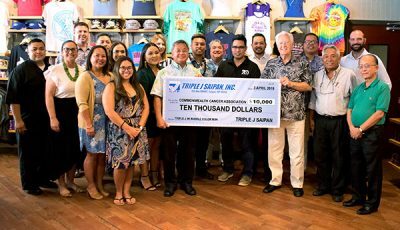 After the short swearing-in ceremony administered by Inos, Tudela reiterated that she will continue Flores’ programs and will retain all the staff at the Saipan Mayor’s Office, including adviser Henry Hofshneider. She also asked everyone in attendance to observe a minute of silence to honor Flores’ memory and to continue to pray for him and his family. Among the well-known programs of the late mayor are the dog control program and beautification campaigns like the planting of flowers and plants on the road medians of the islands’ main thoroughfares. Tudela also announced that she has no intention of running for Saipan mayor after her inherited term expires in January 2015. “I’m not going to run for mayor. I want to give to the younger generation and the younger people the chance to serve as mayor for the next four years. I’m only going to serve the next six months,” she said. She’s also honored to be the first ever woman to occupy the position of mayor on Saipan—and possibly the entire history of the CNMI. Tudela had been living in the U.S. mainland in Arizona where she was taking care of her great-granddaughter. 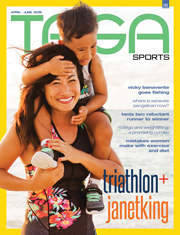 She used to work for the CNMI Medical Referral Program in Honolulu, Hawaii. In a statement, Tudela said her first task is to meet with her staff and review current projects along with daily activities. 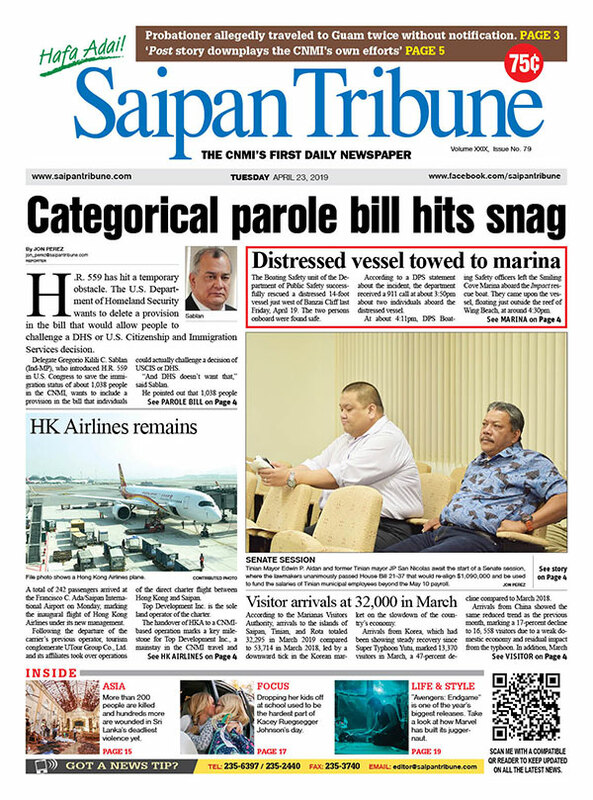 She added that all services currently provided to Saipan residents will continue without interruption. 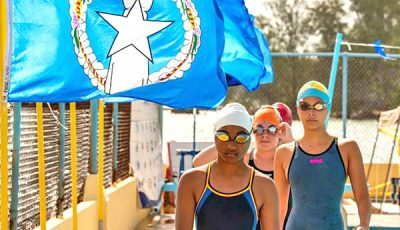 Even though her term as mayor will only be up to January 2015, Tudela said she plans to ensure all relevant laws and regulations are followed as she fulfills her duties and responsibilities to the residents of Saipan.